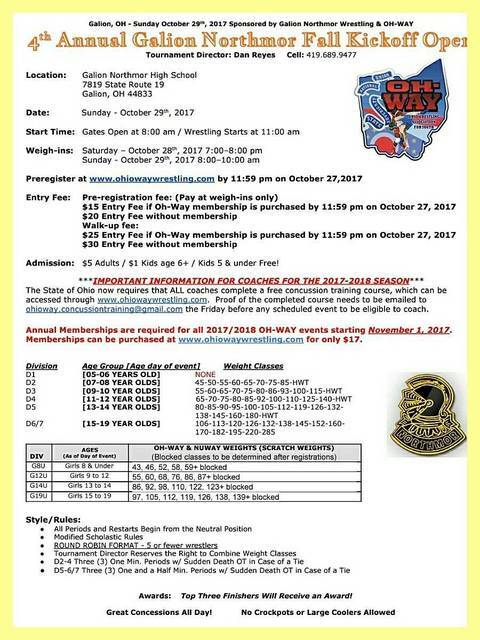 GALION — A great weekend of wrestling is coming up in October from Dan Reyes with Ohio Wrestling Association for Youth (OH-WAY) and Scott Carr, head wrestling coach at Northmor High School. 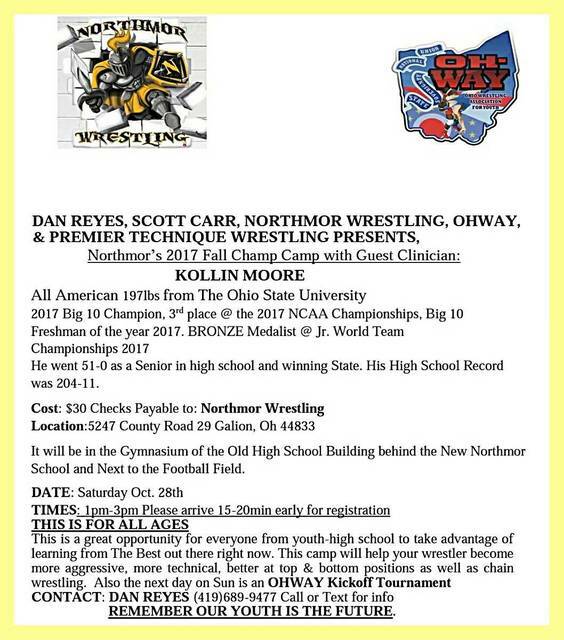 Another Champ Camp at Northmor High School will be held, with special guest clinician Kollin Moore from the Ohio State University wrestling team. Moore is the top-ranked wrestler in his weight class and is projected to win a championship in that class this year. The camp will take place on Saturday, October 28 with a tournament, the OH-WAY National Kick-Off Tournament, will be held the following day. Last year, the tourney had wrestlers from Indiana, Michigan, West Virginia and Pennsylvania in attend the all-ages event. Reyes (OH-WAY) and Carr (Northmor wrestling program) believe that the youth is the future and everyone involved loves doing these events to help them be prepared for it. For more information on OH-WAY or to preregister for the event, visit: www.ohiowaywrestling.com.